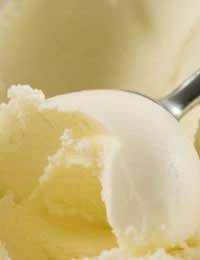 Freezing cold sugar free vanilla ice cream is the perfect accompaniment to many no sugar desserts and cakes. It is also delicious served on its own, or with fresh fruit, in a bowl. Liven it up by adding one or two extra ingredients or combining it with a different flavour. Use a vanilla pod for maximum flavour in this variation of a traditional recipe. Serve with a little grated sugar free chocolate or make into a sundae with chopped nuts, sliced banana and freshly whipped cream. Take a medium sized pan and pour your single and double cream into it. Take your vanilla pod and slit it along one side. Then take a teaspoon and scrape out all the seeds. Put the seeds into the cream. Cut the pod into quarters and drop it into the pan too. Put to one side for half an hour to allow the liquid to draw the flavour. Then heat the cream and milk over a low heat, stirring occasionally, until it almost reaches boiling point. Once again, set aside – this time for 15 minutes. Meanwhile, crack your eggs and separate your yolks into a medium sized bowl. Mix with a fork and then pour your warm vanilla cream in. Return to your pan and place back on a low heat. Keep stirring until the liquid thickens and becomes custard-like. Once again, do not allow the mixture to boil, however. Then remove from the heat, pick out your pieces of vanilla pod and stir in your sweetener. Pour your mixture into a large metal bowl and allow to cool. Stir every so often if a skin seems to be forming. Once cool, cover and place in the freezer. Allow to freeze for about three hours then remove from freezer and whisk in a blender. Replace in the freezer then repeat at least three more times every three hours or so. When you are ready to serve the ice cream, remove from the refrigerator 10 minutes before scooping. The crunch of the sugar free ginger biscuits contrasts beautifully with the creamy vanilla ice cream in the recipe. To zing it up further add small pieces of dark sugar free chocolate (or high cocoa content, dark chocolate) at the biscuit stage. Once again begin by taking a medium sized pan. Pour your milk and your double cream into it. Then take your vanilla pod and slit it along one side. Scrape out all the seeds with a teaspoon and put into the cream. Cut the pod into quarters and drop it into the pan too. Put to one side for half an hour to allow the liquid to draw the flavour. Then heat the cream and milk over a low heat, stirring occasionally, until it almost reaches boiling point. Set to one side for a further quarter of an hour. Meanwhile, crack your three eggs and separate the yolks into a medium sized bowl. Mix with a fork and then pour your warm vanilla mixture in. Return to your pan and place back on a low heat. Keep stirring until the liquid thickens and becomes custard-like. Once again, do not allow the mixture to boil, however. Then remove from the heat, pick out your pieces of vanilla pod and stir in your sweetener. Pour your mixture into a large metal bowl and allow to cool, stirring every so often if a skin seems to be forming. Once cool, cover and place in the freezer. Allow to freeze for about three hours then remove from freezer and whisk in a blender. Replace in the freezer then repeat at least three more times every three hours or so. Meanwhile, take your ginger biscuits and place in a large sandwich bag. Using a rolling pin break into small pieces. After your final whisk, stir in the pieces of biscuit, a few at a time. If you wish to add chocolate chunks too, break your sugar free dark chocolate when you crush your biscuits ands stir them in at the same time.